Our guide and driver will pick up you at your hotel in the morning and transport you for 2 1/2 hours to rural District of My Tho. The cycle ride begins in Cai Be town, where you will cycle 20 km on small trails, and travel country roads through fruit orchards in the rural areas by the Mekong River. Stop for lunch at local restaurant. In the afternoon, the ride will continue with crossing river by ferry to Dong Phu village then continue riding on foot paths through the Island and have another ferry crossing to Vinh Long. Today’ ride will end up in town of Vinh Long. You will have an hour relaxing on A/C van to Can Tho city. Have breakfast before you enjoy a boat ride to Cai Rang floating market. Your boat will go through this market slowly and you will have an opportunity to watch the beautiful scenery and daily activities of the local. Disembark from your boat for another land market where you could find all kinds of farm products here. Then we bike on dirt track through country villages, rice-paddy and crossing a network of canals to Thoi Lai and Co Do Dist. 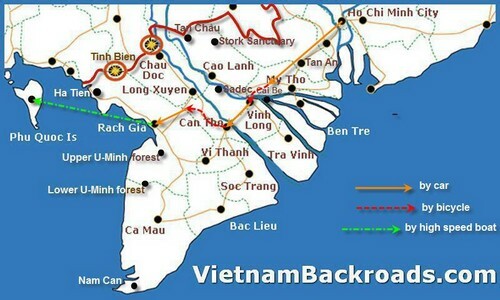 If time permitted, the ride will continue to Tan Hiep before a transfer to Rach Gia city. I would just like to say a big thank you for an amazing tour on our recent visit to Vietnam. Dat was a fantastic guide and he really brought the trip to life with interesting talks as we cycled along, it really added a lot to our trip. The rest of the team were also great as well and made sure the journey was totally faultless. The lunch on the first day was excellent. Hotel was excellent. I really enjoyed the trip to floating market. Mr. Huy was an excellent driver and helpful with equipment. In the future, should make sure the back- up equipment is good. This time, when we had a flat tire, the spare was unusable. I have had an amazing time on tis trip and has easily been the most enjoyable part of our holiday so far. Our guide- Thang is incredible. His knowledge has taught us so much about Vietnam and the way he tailored the tour so that we weren't around lots of tourists which makes it even better. We really want to see the real Vietnam and Thang showed us that. The restaurant on the first night wasn't great though, a little too touristy for us but it might be perfect for others. Thank you so much for organizing this trip. We've really had a great time! Thang was a really excellent guide who has great knowledge and passion about his country. I feel as if I know much more about Vietnam. The food was a particular highlight as we stopped at many local places and samled a great range of food. The hotel on the first night was fine. Then dinner on the first night was ok, but I think we preferred the food from the market Thang showed us. This has been a really wonderful tour, and I will definitely be recommending it! Thank you. Our trip was a great journey and the best way to see the people and their lives in the Mekong Delta. A wonderful insight into the real Mekong Delta. We thoroughly enjoyed this experience and will recommend it to others. Thank you Thang for your time and your interest in showing us these beautiful people, amazing scenery and exceptional food. As we are budget travellers this trip was a big cost for us but we had an excellent time so very glad we did it. We were never pressured in tipping or buying things and snacks/drinks were provided whenever we felt like it which was a good touch. Guide was great fun and made the trip more enjoyable. Dinner was also very good. Very friendly guide. The journey was just challenging. Minivan' diver always providing enough water, snacks. The trip to experience the Mekong Delta was very accommodating to our needs. Ms Quang in the office in Saigon was so nice and helpful too.